Though Saracens went down 13-9 to Clermont in Saint-Étienne, 20 year-old Maro Itoje put in an inspiring performance. We analyse his efforts here. The re-signing of a 20 year-old academy graduate rarely registers on the public consciousness. When news of Maro itoje’s “long-term” deal at Saracens broke a week ago though, there was something of stir. Of course, that was because of the personnel in question. Frankly, there is little this young man cannot do. As evidenced by last summer’s Junior World Championship and a victorious LV= Cup campaign, Itoje is a captain accustomed to lifting trophies. An odd Aviva Premiership outing, plus one outstanding replacement appearance for England Saxons in Cork in January, have underlined his supreme promise at lock. Off the field, he is incredibly humble, refreshingly articulate and even writes the odd stanza of poetry. Despite such impressive credentials, it was still something of a shock that Mark McCall selected Itoje at blindside flanker to face Clermont in this weekend’s European Champions Cup semi-final. Less surprising was the fact that this six foot, five inch specimen met the mighty challenge and excelled, following the trend of an immensely eye-catching career thus far. Indeed, Itoje’s authoritative, influential display was a significant positive for Saracens fans to take from an agonising 13-9 defeat. 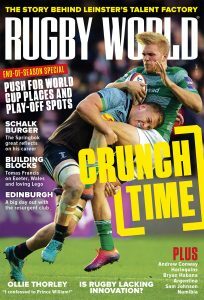 The World Cup will come too soon from him, but Itoje will surely possess Test caps – and perhaps even have toured New Zealand with the British & Irish Lions – before the next contract negotiations come around. Here is how he mixed it with the Top 14 heavyweights. Against such a domineering, powerful outfit as Clermont, scrum and lineout were always going to be integral, and the added ballast offered by Itoje from the back row certainly aided tighthead prop Petrus du Plessis. If this demonstrated technical aptitude, Itoje also showed alertness and rapid reactions. In the second half, there was a rather messier Clermont set-piece. Saracens knew it would require gargantuan industry to get them anywhere near the finish line. Itoje absolutely played his part in that regard, hurling his body into every collision. The tackle on Wesley Fofana as the centre attempts a trademark arc is impressive in itself. If we rewind slightly though, we can appreciate how Itoje stays calm, reads the situation and communicates accordingly. This serves two purposes. First, the Clermont support is impeded cannot generate the quick ball they would like. Clearly, energy and intelligence form a potent blend. Eyeline obscured, Parra sends the ball out on the full and Itoje is rewarded for his superman-style exploits. As we have already seen, Itoje is not afraid to knuckle down to do some unheralded, off-the-ball graft. Such an attitude extends to attack as well. These seemingly simple plays keep teams ticking along and eventually add up to monumental individual performances. Reinforcing his appetite for hard yakka, Itoje resources the ensuing ruck – another job ticked off. Amid a vast amount of unglamorous stuff, there was one piece of play fit for Hollywood. Beating Nick Abendanon before stepping away from Sebastien Vahaamahina and bumping Bardy, Itoje showcases some stunning ability. Rather than those of a timid 20 year-old, these are the actions of a big-game performer embracing a sizeable occasion and thriving. Tellingly, McCall kept him on for the whole 80 minutes, shifting him to lock as Hamilton and Burger were replaced by Kelly Brown and Jackson Wray. It is just as well Maro Itoje does not suffer from stage fright. He is set for an entire career under the brightest spotlight.